Women who drink too much water during labour are at greater than normal risk of a potentially dangerous condition, say scientists. A Swedish study, published in the journal BJOG, revealed women who drank more than 2.5 litres during labour had a 25% chance of hyponatraemia. It can produce headaches, nausea and vomiting, or more severe problems if left unchecked. 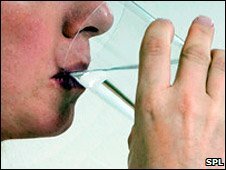 UK midwives said women were encouraged to sip water, rather than drink lots. Hyponatraemia results when an excess of water means that the levels of sodium in the bloodstream fall. In the worst cases, it can cause swelling of the brain, or even coma, although none of the women in the study were affected to this extent. The research involved 287 volunteers, who were allowed to drink freely during labour, with blood samples taken on admission to hospital, and again after the birth. In total, 61 women drank more than 2.5 litres, and 16 of these were found to have hyponatraemia. Dr Vibeke Moen, from the Karolinska Institute in Sweden, which led the research, said: "We conclude that hyponatraemia is not uncommon following labour, and is potentially harmful, but is also easily avoidable. "Women should not be encouraged to drink excessively during labour, and the policy of liberal fluid administration should be questioned." She said that other results linking lower blood sodium levels with longer labours needed to be investigated, as the condition might be influencing the ability of the womb to contract. Professor Philip Steer, the editor in chief of obstetrics and gynaecology journal BJOG, said: "At one time, a myth became prevalent that drinking lots of water each day was a healthy habit. "However, recent research shows clearly that in general, one can trust one's natural body messages, and that we only need to drink more when we feel thirsty." He said that doctors and midwives should keep a note of how much women drink in labour. Gail Johnson, from the Royal College of Midwives, said that she was not aware of any trend among midwives to ask women to drink, even when not thirsty. She said: "We're not encouraging women to drink massive amounts of water, although perhaps we might suggest they take a sip to keep their mouths moist. "One of the reasons is that the stomach does not empty as efficiently during labour, so drinking lots increases the risk of vomiting. "The key thing is for the woman to listen to what her own body is telling her - many women would not want to drink much at all."